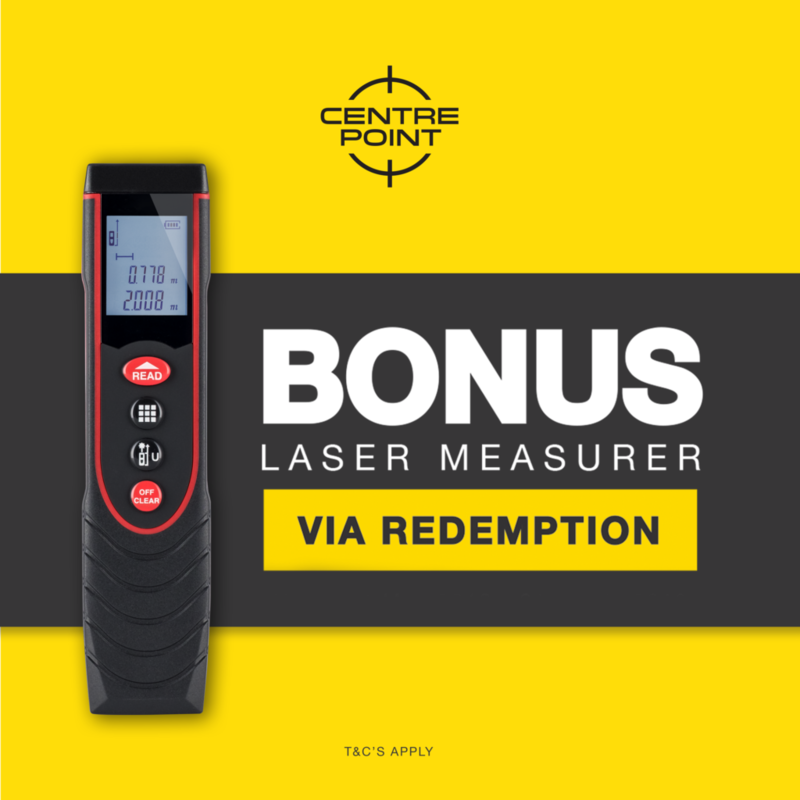 Purchase 1x of the above products and receive 1x 25m Laser Distance Measurer. 1. Information and instructions on how to enter this promotion and claim the redemption form part of these Terms and Conditions. By participating in this promotion including by claiming the redemption, the claimant will be deemed to have accepted these Terms and Conditions and agreed to be contractually bound by them. This offer not valid in conjunction with any other offer or promotion, unless otherwise advised. 2. Promotion only open to Australian and New Zealand residents. 3. To be eligible to claim the redemption offer, an eligible individual must purchase one (1) of the eligible product(s) from an authorised Australian or New Zealand participating dealer/retailer during the period commencing 1st February 2019 and ending 31st March 2019. 4. To claim the redemption, eligible claimants must fully complete and submit all required information using the online redemption link (https://www.spoton.com.au/redemptions). 5. The information that must be provided by claimants in the redemption submission includes: (a) personal and contact details, including full name, phone number, email address, postal address (c) a copy of the purchase receipt which sets out the name of the participating dealer/retailer and that the Eligible Purchase was made during the Promotion Redemption Period but prior to claim submission (d) the serial number of the purchased product (e) the promotional redemption code specified on this flyer. 6. The redeemed goods will be posted to the address submitted with the claim. The claimant is responsible for nominating the correct postal address at the time of completing the redemption submission. 7. Claims are limited to one (1) claim only per Eligible Purchase, per product. For the avoidance of doubt, a claimant is not permitted to submit a claim more than once in respect of the same product. 8. Claimants are requested to allow up to 28 days after the closure of the Promotion Redemption Period for the processing of redemption claims. 9. All information provided to claim this promotional redemption is strictly stored in accordance with our privacy guidelines (https://www.spoton.com.au/privacy).